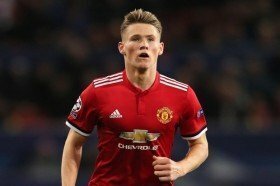 Manchester United have confirmed that they have reached an agreement over a new long-term contract with midfielder Scott McTominay. The Scotland international has not enjoyed the best of seasons with the Red Devils but he has nonetheless been rewarded with a fresh four-and-a-half year deal. "Manchester United has been my life since the age of five and playing for the club I've always supported is all I've ever wanted to do," the academy graduate said on the club's website. McTominay has been subject to limited gametime during the course of the current campaign and he has managed just seven league appearances in the Premier League. As such, he has been fancied to make a temporary move elsewhere to gain experience but manager Ole Gunnar Solskjaer has recently indicated that may not be the case. Under Ole, McTominay has made just the single league appearance and that came during the final stages of the 1-0 triumph over Tottenham Hotspur this month.